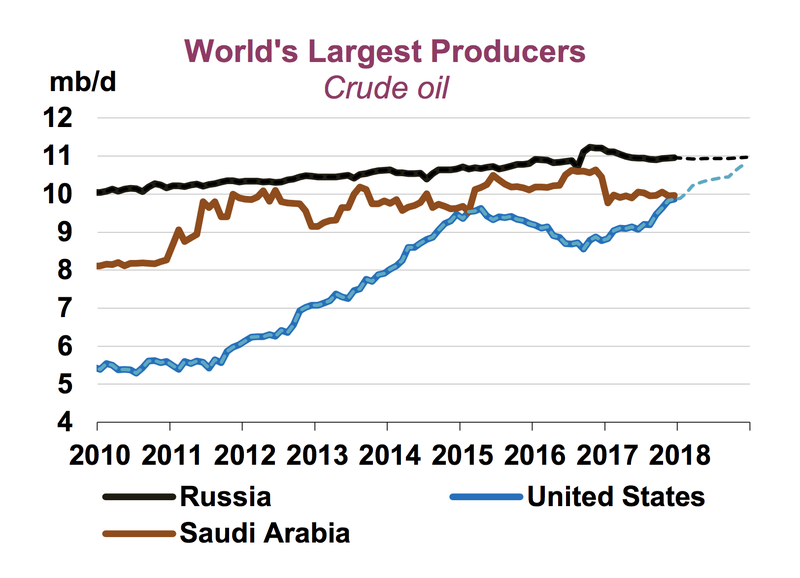 The International Energy Agency predicted Friday that the U.S. will surpass Saudi Arabia in crude output this year and challenge Russia as the world's top producer on the back of "explosive" growth in shale production. Why it matters: While the report is consistent with existing production forecasts, it nonetheless starkly underscores how the U.S. has upended global markets in recent years. "Expect a volatile year": The IEA report predicts that 2018 could be a turbulent year in oil markets, thanks to geopolitical risks and questions about continued compliance with the OPEC agreement. By the numbers: Brent crude oil recently hit 3-year highs of around $70-per-barrel and IEA notes that "the market is clearly tightening" as crude stockpiles have fallen. But IEA says the prospects for higher prices are cloudy. Go deeper: Read the full story here. The WSJ also has a close look at the new IEA supply and demand data here. And IEA's summary of the monthly report is here. What's next: Curbelo says he's hoping the group will soon move from a defensive posture. "[H]opefully in the near future, perhaps this Congress, perhaps next Congress, the caucus can become a true ideas factory where we proffer good policy solutions for the environment, for rising sea levels, for climate change-related challenges," he said. The Trump effect: "I think actually some of his rhetoric and actions on climate policy gave at least some House Republicans a greater impetus to learn about the issue and to get involved." Caveat: As a reminder from your Generate host, this group is somewhat controversial because some critics see it as a paper tiger, noting for instance that it includes one member who introduced a bill to literally abolish the EPA, and more recently most of its GOP members backed the tax bill that opened ANWR to oil drilling. On the record, part 2: Via the Associated Press: "A top manager who supervises the Environmental Protection Agency program responsible for cleaning up the nation's most contaminated properties and waterways told Congress on Thursday that the government needs to plan for the ongoing threat posed to Superfund sites from climate change." Why it matters: The story notes that the testimony is at odds with the climate skepticism and policies of the top echelons of the Trump administration. Place or show: Year-end data from NASA and the National Oceanic and Atmospheric Administration released yesterday shows that 2017 was among the hottest years in the modern temperature record that dates back to the late 1800s. As my colleague Haley Britzky wrote about here, NASA said 2017 was the second-warmest behind the record-setting 2016, while NOAA — which uses slightly different methodology — ranked last year as the third-warmest. Key point: The difference between the heat in 2017 and 2016 is that last year's heat "was not aided by El Niño, the Pacific weather pattern that is usually linked to record-setting heat," the New York Times reports. Why it matters: The latest evidence of the ongoing warming trend will provide fresh data points for advocates of tougher emissions curbs worldwide and critics of White House efforts to abandon Obama-era climate initiatives. This is useful: The Dallas Fed is out with the latest edition of its slideshow that's full of charts about oil and gas prices, U.S. and global production and inventories, employment and more. Small bounce: A short report from IHS Markit summarizes their analyses of how much oil companies will spend on new exploration worldwide in coming years. "Exploration spending fell by more than 50% from 2014 to 2016 with all players forced to retrench spending in this area. Budgets, however, are forecast to rise slowly from 2016 lows through to 2020 but only to 50% of previous peak levels of 2013," they note. To be clear, that blurb is part of a note that pitches their consulting services for governments who are offering new exploration licenses and competing for these relatively scare dollars. Fresh "gap" warning: IEA chief Fatih Birol sounded the alarm again this week about relatively paltry levels of exploration spending in recent years. "The amount of oil that we have discovered last year was the lowest in the last 40 years. Why? Because the exploration investments are very, very low," he said at a Council on Foreign Relations event Wednesday, warning of a "supply gap beginning of 2020s unless we see major investments coming in the next few years." Nearby action: Via Reuters, "An auction of deepwater oil and gas fields in Mexico this month may prove the last major opportunity for President Enrique Pena Nieto’s government to capitalize on its opening of the energy sector, the central plank of its economic agenda." Iraq: Bloomberg reports that BP has agreed to help Iraq's government bolster oil production from the big Kirkuk oilfield in the Kurdish region. The Financial Times notes that the new agreement "further cements Baghdad’s control over the disputed region, retaken by the Iraqi military in the wake of the failed bid by the Kurdistan Regional Government to secure independence." Every picture tells a story: The chart above, adapted from a brief new Energy Information Administration report, shows that the federal agency projects total U.S. fossil fuel production in to set new records this year and in 2019. Why it matters: It also tells the story of major changes in the overall U.S. energy picture — note the widening bands for crude oil and natural gas, which stems from the shale boom. The narrowing coal share is the result of losing lots of market share to gas (and renewables) in power markets. "As recently as 2010, coal was the leading source of U.S. fossil fuel production, but it was surpassed by dry natural gas in 2011 and by crude oil in 2015," EIA notes.